Of all the things going on in obstetrics today, I truly believe that the induction epidemic is the biggest issue, the ugliest problem, and the subject that we most need to talk about with women. In fact, it is my opinion that if we were to simply LOWER THE INDUCTION RATE we would drastically decrease the cesarean section rate. Of course, I don't expect you to just listen to me. There are a hundred reasons why a woman would be induced for labor and many of them are certainly legitimate. My concern (and the concern of many who are paying attention and value the lives of women and the unborn) is that inductions are being done far too often and are in fact negatively impacting birth and creating problems that wouldn't have existed otherwise. Let's start with some information from the Mayo Clinic. They are legit and medical and all the things that I am not. But the folks over at the Mayo Clinic recognize that induction is not without risk and should be considered carefully and thoughtfully. ~Why am I being induced? Have I researched this reason? Your care provider is an expert. They went to school for a long time. It would be wonderful if I could say that across the board women can trust that their care provider's opinion is in the best interest of them AND their baby. I wish I could say that. Question everything. Research (and I mean REALLY research). Read articles. Study. Get a second opinion from somebody in a different practice. It boggles my mind that we get a second opinion when it comes to our gallbladder but totally skip this when it comes to our own BABY. You may or may not come to the conclusion that induction is right for you. That is great. But you should come to that conclusion fully facing the TRUTH of the risks on both sides. When we become mother's we need to start making hard choices and stop blindly leaping into things because everybody else is doing it. ~Do the risks of staying pregnant OUTWEIGH the risks of induction? Let's be real. The end of pregnancy is kind of crappy. A hundred years ago women just had to wait for mother nature to kick in before they could get rid of the swelling and the sore hips and the gas and the other unpleasantness. Not today. I know a lot of care providers probably push unnecessary inductions. But I have gone a week and a half overdue and I know for a fact that putting that frosted brownie (induction) in front of a woman on a diet (end of pregnancy) is pretty stinking tempting. There is no shame in admitting that we sometimes want to be induced. But it is sad to be induced because you are uncomfortable and then have one of those very negative things listed above happen when it didn't need to happen. So- do the risks of staying pregnant really outweigh the risks of induction? Or are we getting induced because we are miserable, our doc is going out of town, we don't want to have the baby on the weekend, or we hit the magical 40 week mark? ~Is my care provider being honest with me about the risks of induction? I realize that I am going on and on about the risk of induction. It is a fact that induction can increase risks. BUT- hospitals and doctors are pretty amazing. You most likely will not die from your induction. You could die from an induction- (and your baby could too)- but you probably won't. Even if things go a little nuts they can probably be fixed with a drug or a surgery and both mom and baby will survive and even be healthy within a few weeks. So, even with an induction all will probably be fine. But is your care provider aware and open and HONEST about the above listed risks of induction? Sometimes it seems to me that the risks of induction are often waved away with a flick of the wrist and a date is scheduled (or threatened). If your provider induces everybody, has a high c-section rate (over 15%), manages to work obstetrics like it is a nine-to-five job, then you might want to pause and consider what is going on. Are you being induced because it is needed or because it is convenient? Is a reason for your induction being manufactured or is it legitimate? Do I realize what an induction entails? Education about birth and what happens in our bodies AND what happens during typical procedures is imperative to making a truly informed birth choice. I like this post from Midwife Thinking on what really happens when we consent to induction. I don't know how many times I have talked to women and they state that they had no idea that when X happened so would Y and Z. An induction usually involves an IV of Pitocin. It usually involves constant monitoring of mother and baby by an EFM. Those two things combined make it pretty hard to walk around or move or otherwise encourage contractions in a normal, natural, way. Many women also get an epidural after the induction begins. This usually means a urinary catheter is inserted too. I just want you to take a moment and count how many tubes will be coming out of your body at this point. Now think about how that will impact your birth. And if you are a first time mom, you deserve to know also that your are doubling your chance of c-section. Doubling. 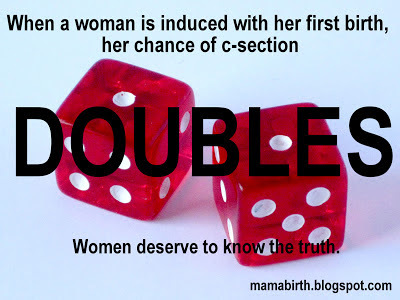 If you truly want to avoid a c-section your first step is most likely avoiding an induction. Do I realize the risks of induction on my baby? I assume that all mother's are truly concerned about their little one's well being more than their own. When I teach natural birth classes women are often motivated to "go natural" because they want the best start for their baby. The same thing (a healthy baby) is often also a motivator for an induction. Are their risks to getting that baby out a week or two early? I want you to know that I realize that sometimes inductions ARE necessary for the health of mom or baby or both. (I always get angry comments from people who needed their induction. I am not actually picking on you.) But the rates we are seeing for inductions (and augmentation of labor) is frankly ridiculous and is the very first problem we should address when we start talking about the equally outrageous c-section rate. Know your options. Know the risks. Know the benefits. THEN make your choice. That is all we can do. Your option is to not give consent for an induction! Are your blood sugars under control? Are you on insulin? If gestational diabetes is well controlled with diet & exercise, and you are not on insulin or have any other health issues & baby looks good, it may be worth waiting for labor to start on its own. I was induced at 38+2 with my second baby. The reason was because of gestational diabetes. They told me that "38 weeks is preferable to get baby out when the mother has diabetes, and we certainly wouldnt want your pregnancy to last more than 40 weeks as after this time the womb could become a inhospitable environment for baby" but never really elaborated. I researched, probably not as well as I could have done, and out of fear I consented to the induction. Fear because my last birth had not gone well, and fear of the unknown that the diabetes was giving me. I am getting a glucose tolerance test at 16 weeks this time round to check if I am diabetic. Hopefully I am not, but if I am I will be diet controlling, and making sure I do so, and declining induction unless there is a damned good reason. KDelano...I've been to South Korea and know what hospital you are referring to. You do not need to consent to being induced. The more birth stories I hear the more upset it makes me. New, and sometimes not new, moms and dads get bullied and threatened into unneeded medical interventions that have lasting impacts on everyone. Right now you fear the unknown because you haven't done this before. If they induce and the typical happens...Pitocin, epidural, stuck in the bed, not progressing fast enough for them, baby's heart rate decelerates, sorry, emergency c-section, now drugged mother and infant, bonding interrupted, breast feeding troubles, mom just had major surgery so she's in lots of pain, etc, etc, etc...if all this happens, like it does for a lot of induced moms, imagine how much you will fear birth the next time around. Continue your research, be informed and be empowered...this is your body, your health and your baby, listen to your gut, momma knows best. Induction is not a minor procedure...what medical professionals won't tell you are all the "minor complications" your baby can have if he/she is not fully ready to be born. Of course we have great medical interventions that allow preemie, preemie babies to live, it's not about will the baby survive, it's how healthy will your baby be? As a new mom, this is the right time to start standing up for and protecting your baby, the medical professionals don't always know best, and you have every right to make informed decisions. Couldn't have put it better ! My sugars are under control and I'm not on insulin. I guess I just feel really bullied into being induced. What makes it worse is the doctors are military so my husband can't even stand up for me or what I want because theyre higher ranking than he is. thank you for your input, I'm definitely going to try my hardest to let labor start on its own. Great post! I hear about a lot of women having inductions without knowing about the risks and doctors vaguely threatening that their babies will be in danger if they do not induce. Thank you for encouraging women to research and get informed! It would be great if you could provide some guidance on what are credible sources of information. Unfortunately here are many unreliable sources out there, and often people are overwhelmed by info or unable to discern what is a credible source. Where can women find actual studies to read? Maybe that would be a nice post? I love your blog. Thank you for writing it!! I was induced with my two kids after my water broke and labor didn't naturally start. My first was 37.5 weeks and my second 36.5 weeks. Was it necessary? With my second I was also found to have a short cervix (1.5 cm) at 32 weeks, and when my water broke, we didn't have my strep B results back yet. A friend of mine has 5 kids. She was induced with her first 4 for various reasons, but with her 5th they said it would be do risky to induce again... is this true? I want a big family so I don't want to "use up" all of my inductions on un-necessary labors and not have them when I might really need it. Also, I'm 11 weeks pregnant now and really scared about the short cervix thing. Is it likely to occur again with this pregnancy? I have an appointment at the hospital tomorrow and I'm hoping they will do an ultrasound of the cervix so that I know where I'm at right now. EXCELLENT post. I really think people underestimate the risks of an induction. It breaks my heart to hear people who elect for one just because they're "tired of being pregnant" :/ So many of these women KNOW the risks and just don't care :( and then there's the ones who's doctors won't even tell them about the risks and just use scare tactics. Thank you for sharing this information and trying to get the word out that inductions are not always necessary. I had to have one myself, but was blessed with a team of midwives who made sure that I knew what the risks were both ways and what to expect. They also allowed me to try to start contractions with cervical ripeners only before doing pitocin (the ripeners worked) so that can sometimes be another option especially if you are really close to your due date anyway (I was one week away). I wish all moms who got inductions could have this kind of experience where they are well informed and know that they are making the best choice. We did have some breastfeeding issues that I regret, but because I was so well informed I know I made the right choice since I had a rare liver condition that was spreading toxins to my daughter and could have caused her to be stillborn if too many got into her system. To Anonymous on Oct 12......thank you....your "snowball scenario" is,sooo true.....arrive too early, pit drip, epi.......Bleeeck. Now, 10 months,later....i have to process all my feelings about baby O. birth I actually feel like,i want to be pregnant again, so I can have,the,birth I evisioned...BUT THAT IS WRONG, WRONG, WRONG!!! Sooooo I think abiut the numbness I frequently get in my R hand, the intermittent lower back pain (no I am not overweight wasnt ever 5'4 119#) hmmm side effects from the dam* epidural??? I have a hard time,getting to a,birth trauma group, because Baby O. is napping at that time AND we live 35 miles from town. Sometime in the next year I will get there, I will Fully process this birth. I agree with what you have said about the risks of inducing, but I don't think you mentioned the risks of continuing a pregnancy postdates- most importantly, that the rate of still birth goes up when you go postdates. I believe that you need to weigh up the risks of induction with the risks of a post-dates pregnancy in these cases (while of course monitoring the baby closely). I delivered my fifth child in January 2013 at 41 weeks and 6 days. My hospital midwife was going to try to induce me right at 42 weeks, but she was very supportive of my decision to wait until labor started on its own. My babies tend to arrive late, and I've never been induced in the past. Since I am 41, the maternal fetal specialist who did my ultrasounds was strongly recommending an induction at 39 weeks due to a 1% chance of stillbirth past 40 weeks at my age. While I appreciated his concern, I ignored his advice. I am so glad I trusted God and my body to bring forth our son safely and naturally. Our son is healthy and thriving. Thanks for sharing. My mom never could go into labor, they induced her and everything. But labor just never came. I wonder what an obstetrics in Tallahassee, FL today would say about that. All three of her babies were C-sections. ANY kind of "invasive" procedure ... like labor induction ... does not come without risk. It's true -- one of the biggest risks is that your birth will result in a c-section. Let's face the music. Inductions are tampering with Mother Nature. However, I strongly believe there are some rock solid reasons for being induced. The key factor? You've got to trust your care provider/s in helping you to make a decision about being induced. AND you've got to trust your own body, your common sense, and your better judgement. Sometimes inductions are absolutely necessary ... and sometimes not. “Obstetric lie: Induction is risk free.” If you’re claiming that obstetricians lie in saying inductions are risk free, it’s probably not a good idea to cite other obstetricians (the Mayo Clinic) to prove your point. Because obstetricians lie! They don’t have your best interest at heart! Yet that article also says “TRUST your health care provider to help you make the best decision in your case.” So the Mayo Clinic couldn’t possibly be a “legit” source, could it? And honestly. Can you prove that any obstetrician has ever said that there are NO risks in induction? Can you find me an induction consent form that doesn’t list the risks? No, you can’t. Are women too stupid to read and understand that consent form? No, they’re not. Is your title disingenuous? Yes, it is. You say, “When we become mother's [sic] we need to start making hard choices and stop blindly leaping into things because everybody else is doing it.” That works two ways. This woman readily admits that following natural childbirth dogma killed her baby: “I believed, completely and absolutely, that I was doing the right thing by avoiding induction and staying home until I was ready to give birth. I allowed popular birth culture to color my decisions” (http://www.thedestinymanifest.com/2012/09/the-vantage-point-of-hindsight/). Imagine the good you could do if you reassured women that the benefits of induction outweigh the risks. If the woman in that story had known that, perhaps her tragedy could have been avoided. Imagine the good you could do if you stopped making vague, unverifiable claims about physicians’ motives. Of course a patient should ask questions. But only her doctor has examined her and done appropriate tests. Advice from a blogger does not trump that. And when I say “advice,” I mean attempts to moralize a procedure which is morally neutral. When someone says, “There is no shame in . . .” it generally means she DOES think there’s shame involved, and a “but” is coming. Yep, here it is: “But it is sad to be induced . . .” Why? Because it’s not nice to fool Mother Nature? (“A hundred years ago women just had to wait for mother nature to kick in . . .”) And a hundred years ago babies died of complications which can be prevented by inductions today. It makes no difference whether those inductions are medically indicated or maternally requested. We should value the lives of women and the unborn more than we do an “all natural” ideology. I hope you’ll reconsider this post.